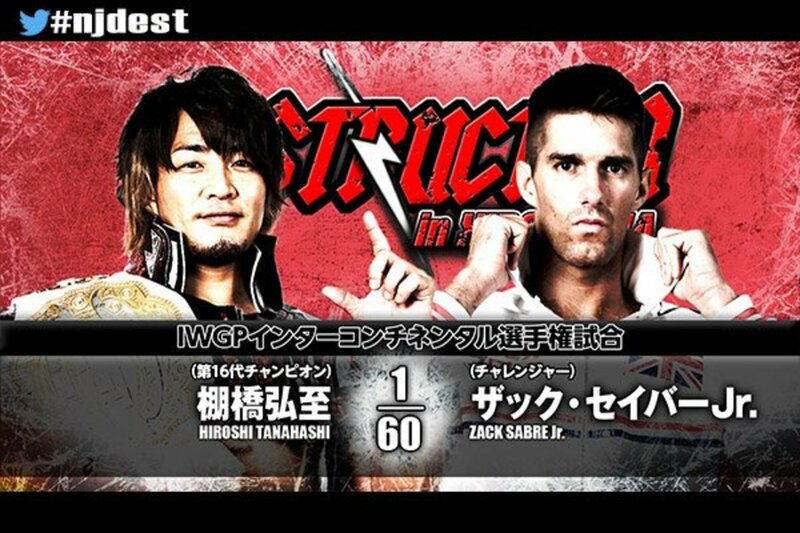 NJPW Destruction in Hiroshima results: Tanahashi vs. Zack Sabre Jr.
Kevin Kelly is in Hiroshima for tonight’s English broadcast. Don Callis doesn’t seem to be around; Kelly said he was back in Canada with Kenny Omega. Good, basic bout that picked up a bit toward the end. YOSHI-HASHI and Tiger Mask had a pretty fun exchange, Tiger Mask even managed to land the Tiger Driver for a near fall. YOSHI-HASHI followed with the butterfly lock for the submission win. This was fine, but nothing special. Still pretty obvious that Tonga is green but at least is protected well in what he can and can’t do. Both Robinson and Finlay escaped from a double chokeslam attempt by Tonga. Finlay landed the stunner and Robinson got the pin with the pulp friction. This was also solid, but not much either. For this being their final match, the crowd wasn’t very into it. Heels got the advantage early, but were cut off. Baretta pinned Owens after a strong zero/dropkick combination. Yujiro took the mic after the match and asked Baretta to rejoin the junior heavyweight division. But he also provided him with another alternative: face him in a singles match. Baretta seemed to accept, meaning they’ll face one another somewhere down the line. Suzuki and Ibushi brawled early. Both he and Makabe managed to take on Suzuki. Iizuka choked Ibushi as Suzuki-gun regained offense. Iizuka choked Ibushi with a rope then went for the iron fingers but Elgin laid him out. Ibushi came back, hit a standing moonsault then scored the victory with the kamigoye. This was a fantastic match, easily the best match on this tour so far. Ricochet continually shines as a fantastic athlete and Taguchi has really found his niche and knows what his role is in these kind of big matches. Taichi and Kanemaru were fine for the most part as well, though their offense early was the usual Suzuki-gun fare. Heels worked on Taguchi early after a double team effort by he and Ricochet failed, and he ended up being cornered by both heels. He eventually got the hot tag to Ricochet, who made a great comeback. Using his whiskey, Kanemaru took out Ricochet as Taichi rolled up Ricochet with the Gedo clutch for a near fall. Kanemaru worked on Taguchi, hitting the deep impact DDT, but Taguchi kicked out, I think a first since Kanemaru came to New Japan. Taguchi countered with an ankle lock. Taichi came in and used his microphone stand to break it up. He made Taguchi drink the whiskey. They hit double superkicks, then lay out Taguchi with a powerbomb/moonsault combination...but he still kicked out! They take him to the top rope, but Taguchi comes back and hits a hip attack on Taichi, then Ricochet comes back and lays out Kanemaru with a super rana. Ricochet took out Taichi with a super suicide dive onto the ramp as Taguchi laid in the ankle lock. Kanemaru tried to get to the ropes, but Ricochet hit a springboard 450 splash, then took out Taichi with another dive. Kanemaru submitted not too long after. Rocky Romero (who was doing commentary) came into the ring after the match. Tonight, the next generation of Roppongi Vice is born. Taguchi is not the only coach in the game. He is bringing in a team bigger and faster than them. Roppongi 3K are coming for them. Ricochet says he doesn’t know who Roppongi 3K are, but bring them on because at the end of the day, Taguchi Japan will be IWGP Jr. tag team champions...forever. I don't know who Roppongi 3K are either, but if I had to guess we will probably be seeing them at the Super Junior Tag tournament that is usually held in October. Sho and Yo, maybe? This was good, probably a bit better than their match at the first Destruction card. If you like a match with a bunch of moves, this is your match. Lots of brawling in and around the ring to start. Archer and Smith dominated, working over Hanson. Tama Tonga then came in and continued to work on him. Hanson hit a springboard elbow on Tonga and made a tag to Rowe. Guerillas of Destiny took over and worked over Rowe, even hitting the Guerrilla Warfare. Tonga went to cover, but Smith was the legal man so the referee wouldn’t count. Everyone came in to attack, and when the dust settled it was KES trying to lay out Rowe, but the Guerillas interfered. Archer took them out with a dive as War Machine back back and laid out Smith with the Fallout for the win. Ospreay and Takahashi started things off and looked great. Naito and Ishii worked well against one another as well. We then got Okada and EVIL. Okada went for the rainmaker but EVIL escaped. He went for the STO but Okada countered with the dropkick. BUSHI and Gedo came in next, then everyone else followed. EVIL did end up laying out Okada with the STO as BUSHI laid out Gedo with the MX for the win. Pretty good match overall. Naito took out Ishii on the ramp after the match, hitting a running dropkick on his bad leg. That’ll probably be the story of their match next month. EVIL followed suit, laying out Okada on top of some chairs with the Darkness Falls. Naito put Ishii in a figure four, then got up and celebrated with the rest of LIJ. This was good, not great. Desperado is pretty good but this didn’t live up to other Junior heavyweight titles. Not bad at all, just a notch below other title matches this year. Cool finish, though. After some mat wrestling, Desperado gained the advantage and took out his guitar to use, since that is his new gimmick now. He also had a whip and continually struck KUSHIDA with it. The ref somehow did not notice this. The assault continued as Desperado laid in the stretch muffler, then modified it by grabbing KUSHIDA’s arm. KUSHIDA rallied back and went for the Back to the Future but pushed him into the referee, took off his mask, and threw it at KUSHIDA. The referee threatened to end the match, but didn’t, instead handing Desperado’s mask back to him. In all the confusion, Desperado low blowed KUSHIDA and went for a cover, but another kickout. Desperado hit the guitarra de angel but KUSHIDA kicked out, then blocked Desperado, rolls through and goes for Back to the Future but Desperado blocked it. KUSHIDA runs into a chair Desperado had earlier set up in the match. He went one of this moves off the top rope, but KUSHIDA launches to the floor with the hoverboard lock. Desperado hung in until KUSHIDA grabbed him, lifted him up and dropped him with the Back to the Future for the win. Will Ospreay came out after the match. He say that he is being defined as a man who can’t beat KUSHIDA. He wants to be defined up as someone who gets right back up after being beaten. He wants to change the junior heavyweight division and New Japan Pro Wrestling. Ospreay challenges KUSHIDA at King of Pro Wrestling for the title. But hold on! Hiromu Takahashi comes in...then promptly gets knocked right out with a punch by Will Ospreay. Oops. The other two leave as Takahashi throws a fit in the ring. This was awesome. Sabre is so excellent at his style and that made this title match feel different than the others we've seen on other big cards. New Japan has been embracing a fast paced, all out type of match that can be pretty tremendous, but also can easily fall into patterns that are easy to figure out. This wasn't the case here -- Sabre made Tanahashi work his style for the bulk of this match, and made it something completely unique, different and cool. Sabre spent the early part of the match maintaining control of Tanahashi’s arms, working them over and even using them to chokes Tanahashi. He eventually caught him by stepping over his arms and sending him out of the ring, flustered. Sabre responds by taking down Tanahashi and working on his injured bicep, using his hand as a plaything as he twisted it around. Locking in the injured arm with his feet, he uses his hands to torque and pull on his legs. Tanahashi managed to get up and start planting Sabre with elbows. He went for a elbow drop, but Sabre caught him with a arm scissors. Tanahashi escaped and backed Sabre to a corner but Sabre attacked him with kicks to the bicep. After exchanging some near falls, along with some great back and forth, Sabre struck Tanahashi with another kick to the bicep, then struck it with some palm strikes. Sabre locked him in with a gogoplata, but Tanahashi shifted his feet and managed to transition into the cloverleaf. Sabre countered by grabbing his feet until Tanahashi made it to the ropes. Tanahashi tried for the slingblade, but Sabre caught him with the octopus hold. Tanahashi managed to escape as Ospreay made it to the outside. Tanahashi went to the top rope and hit the high fly flow, then followed with another. He went for a third, but Minoru Suzuki came in pushed him out of the ring. He collided into the referee (who was distracted by Taka Michinoku), then went for a sleeper on Tanahashi. He released him as Sabre hit a penalty kick, then covered Tanahashi....but he kicked out. Elgin then came in and beat up Suzuki, sending him to the back. Sabre gained the advantage after all the hubbub and started to pick apart Tanahashi’s bandages, but Tanahashi escaped. Sabre continued with a guillotine, but Tanahashi escaped that and hit three twist and shouts, then finally hit the slingblade. He then followed with the high fly flow and scored the win. After the match, Tanahashi called out another person who beat him during the G1...Kota Ibushi. He came to the ring as the two had a staredown, then nodded and after hearing what Tanahashi had to say, left. Kawato handed him his infamous air guitar, then played to the crowd as the show ended. After a disappointing first show, the second Destruction show turned out to be pretty great, exceeding it pretty much in every way. The first few matches were just kind of there, as was the crowd, but things picked up after the Junior tag team title matches and the rest of the card delivered, including the key title matches and the main event. It also did a fantastic job in setting up key matches for King of Pro Wrestling, which sounds like a stacked card all things considering. Hopefully the final card will deliver just as much as this one did.